Maybe you already know about traditional Vietnamese Dumplings with pork meat filling. 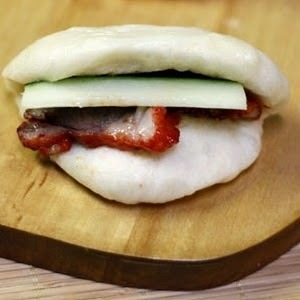 However, today I want to change a little from many stunning Vietnamese Food Recipes when making Char Siew Dumplings (Bánh Bao Xá Xíu) for my family. The soft cover combines with the tasty filling will great a spectacular flavor in your mouth. It is not only delicious but also healthy. Together show your cooking skills by making this amazing food. If you are a Vietnamese Gourmet, you should not miss a chance to cook and taste one of delicious Vietnamese Food Recipes like this one. I bet you will not regret about this decision. When you do want to cook, please follow our instruction below carefully and let us together start making right now. Step 1: Wash the cushion port with light salty water, let it dry naturally. Add ½ spoon of five-spice powder. 1 tablespoon of soy sauce, 1 spoon of sugar, 1 spoon of oyster oil, ½ spoon of salt and some drops of red food colouring. Use your hand to mix them up, rub them on the surface of the meat and marinate overnight. The next day, you need to heat up some cooking oil, stir fry the garlic, add the pork into the pan, stir fry it, then pour in a little bit of water, seal the lid until you can use the chopsticks stick into the pork and see that it is soften & cooked while the sauce is condensed. Turn off the heat, take the pork out to a plate, and slice it. Step 2: Mix sugar, salt, baking powder, flour into a clean tray. Step 3: Warm up the fresh milk at 50oC, or let the fresh milk into the microwave in 30 seconds, then use a spoon to sprinkle the instant yeast on the milk’s surface, let it there for 10 minutes. Step 4: Mix the mixture in step 2 with step 3, use a tablespoon to stir them all. Step 5: Until the powder mixture is shaped into one shape, put it out on a tray or a cutting board, knead in 5 -10 minutes, add cooking oil and continue kneading for extra 3 minutes. Use another clean tray, rub cooking oil in the tray, add the powder shape in and incubate from 50 minutes to 1 hour, depend on the weather condition. Step 6: After the powder shape becomes bigger, you divide it into 8 smaller pieces. Use your hand to punch those pieces to remove the air. 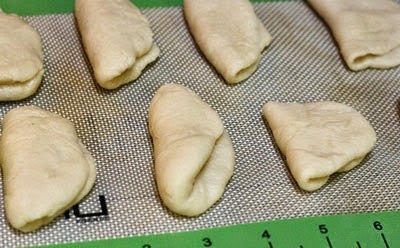 Step 7: Use rolling dough, press on the powder balls and make it long. Step 8: Use clean chopsticks, spread a little bit of cooking oil on it, and put it in the middle of powder pieces in. Step 7: Fold it in half, gently remove the chopsticks. Continue doing this for the remaining powder pieces. Step 9: Put those dumplings into a tray, incubate in 30 minutes, when incubating it, you need to remember to use a thin towel cover the powder’s surface. 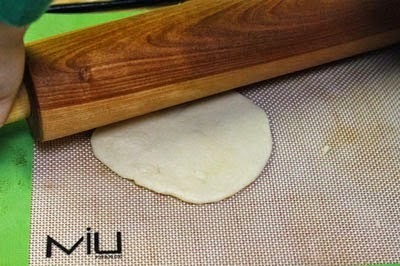 Otherwise, the powder will be dried and one of our delicious Vietnamese Food Recipes will not successfully make. 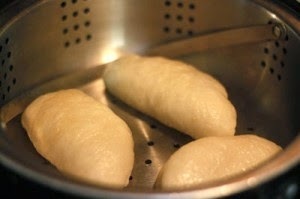 Step 10: Boil the water in the steamer, add the dumplings in one by one, steam it from 8 – 10 minutes, sometimes you need to clean the water on the lid. When the dumplings are cooked, take it out on a plate and continue until you finish the rest. Step 11: Wash the cucumber, remove the inner, and slice it. 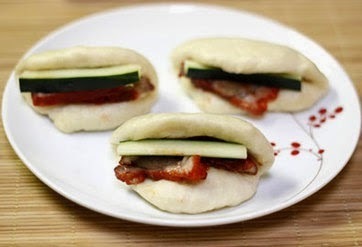 To sum up, you can serve the dumplings with a piece of pork and a slice of cucumber in the middle. 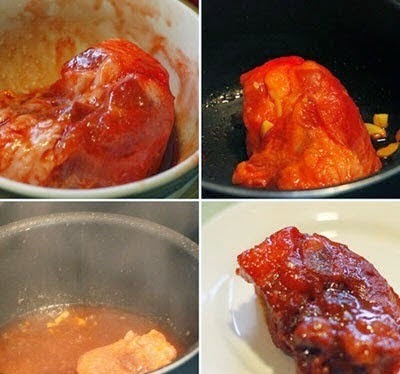 If it tastes a little bit pale, then you can pour the meat sauce in or some soy sauce when eating it. Hope you love this dish and do not miss our next Vietnamese Food Recipes soon. Good Luck for your Cooking.